I don’t need to. At least . . . not this time. You see, Sullivan Central High had another armed adult at school that day. Her name was Carolyn Gudger. Carolyn Gudger was stationed at Sullivan Central High as a “resource officer.” She was part of a growing trend to have trained, response ready security protecting schools across the country. Alerted by a secretary in the principal’s office, Carolyn rushed to confront the gunman. She held him at bay until police arrived. Every student and teacher (principal included) who arrived at school that day – went home alive. Is it safe to assume that every child at Sullivan Central High School received a hug that day? I think so. And that is the image I want to leave in your mind. Every. Single. Child. Hugged. With the number of mass shootings increasing in the United States - principals, teachers and school boards must answer a difficult question: How do we protect our children? How would your church handle a Thomas Richard Cowan walking down the aisle? Slowly making his way toward the pulpit. Unfortunately, today, the answer to this question is more important than ever. Church shootings are on the rise. According to a recent survey conducted by criminologist Dallas Drake, Church shootings have more than doubled. •	From 1980 to 2005 (25 years) there were a total of 137 church shootings. •	From 2006 to 2015 (9 years) there were a total of 147 church shootings. Quick math: Well, let’s just say those are not encouraging numbers. More churches are concerned about violent emerging events. And, of course, more churches are putting together safety or security teams. Deacons, laymen and pastors can turn to many resources to help them begin the planning process. There are plenty of seminars and white papers. Enough information to start the process. (Reference U.S. Department of Home Land Security, FEMA, Lifeway, Everbridge, Ministrysafe, Strategos, etc.) But is that enough? We don’t think so. The issue is this: almost all church security or safety training is seminar driven. Seminars aren’t bad, but they (along with white papers) should be seen as a starting place, not an ending place. We offer something more concrete. More real-world, practical, and efficient. For instance, one of the many things we offer is a detailed security plan centered around your church and your needs. A plan specifically tailored to your unique situation. In the event of a potential threat or active shooter - you and your church will know exactly what to do. Without thinking. Without guessing under intense pressure - when every second could mean one more life saved – you are prepared to act. But first - before we get into that - let’s address some questions that you are probably thinking about. 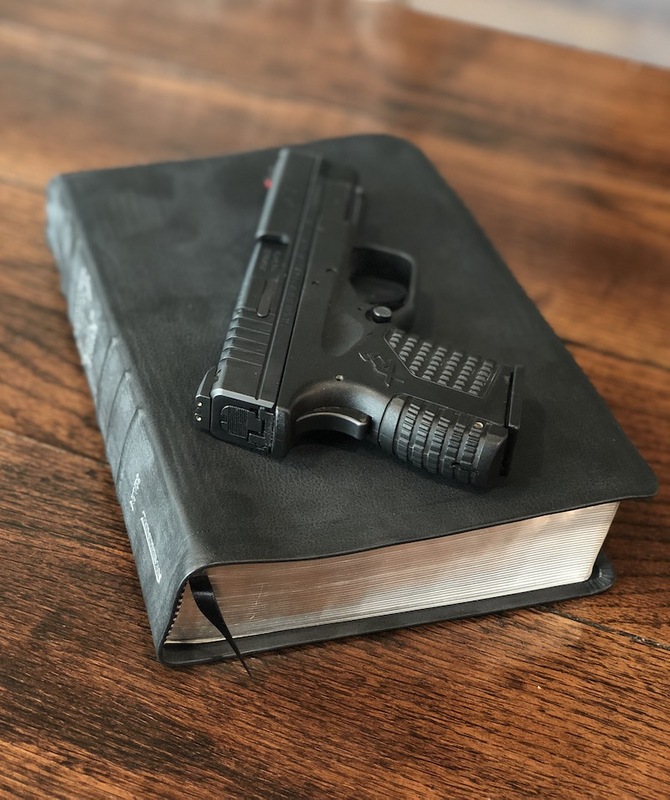 •	What is the Biblical view of guns and defense in the church? •	What are the religious ramifications of weapons in a house of worship? •	Shouldn’t we trust God to take care of us? Everything we do in our ministry must be in accordance with scripture. We are the Lord’s people and His word must guide us. 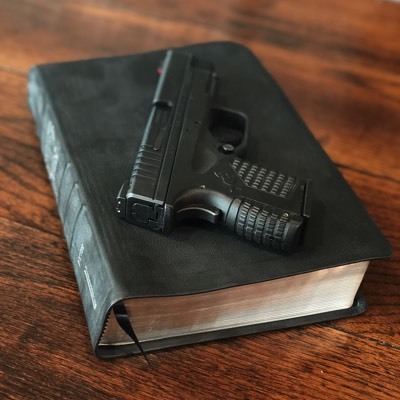 What does the Bible say about Weapons, Defense, and the Church? There are those who hesitate to have armed guards or security teams in their church. They feel armed security measures run counter to the scriptures and the dictates of their hearts. I fully understand that sentiment. I know the objection comes from a good place, in a good Christian heart. But to put it plainly, the sentiment misses one big, key component. We tend to think in individual terms about violence and defense. Our error in thinking involves one of scale. A nation is responsible for the safety of its citizens. And, on a smaller scale, a pastor is responsible for the safety of his congregation. The Bible specifically references placing guards around the Holy Temple. 12 These divisions of the gatekeepers, through their leaders, had duties for ministering in the temple of the Lord, just as their relatives had. 13 Lots were cast for each gate, according to their families, young and old alike. Guards were set around the Temple from the North, South, East and West. Defense was formed from within. Families drew lots for guard duty. Well, you might be thinking, that is just one example. A special circumstance afforded to David by God. Are there other references in the Bible to armed defense? Absolutely. Abundant examples. You can’t but help stumble over the many references to weapons and defense in the Bible. After Babylonian rule and Persian captivity, the Israelites began to rebuild Jerusalem and the wall. God was with them, but they also had responsibilities given to them to ensure success. They rebuilt the wall with a trowel in one hand and a sword in the other. Half of them guarded and half worked. God doesn’t intend everyone to be a martyr. But the examples don’t end there. For reference, read Kings, Chronicles, and Judges. God advocated leadership, safety, and security for His people. They lived in a dangerous world with people who were against them from within and without. So do we. The tools have changed. The heart of mankind is still the same. A conversational sticking point for many believers is associating active defense with outright violence. After all, Jesus brought a message of peace, love and salvation. If we are to model our lives after Christ - How do we reconcile the taking of defense into our own hands? But to me, it seems obvious. Jesus was here to fulfill his Father's will. His destiny was the Cross. Our salvation. Peter was thwarting the will of God. On the other hand, a pastor's obligation is to his flock. A pastor must educate, lead, edify and DEFEND. Yes, we are all to bear our own Cross. But the Bible makes clear that the shepherd must guard his flock. In the deadliest church shooting in American history, one man stood in the way of complete destruction. The only problem? He was a neighbor – several houses away. But Stephen’s bravery overcame his fear. He states, “I kept hearing the shots. One after another. Rapid shots. Pop. Pop. Pop. I knew that every one of those shots represented a life.” 26 lives to be exact. Many of them children. We will always consider Stephen a hero. For Stephen’s part – he will always feel he did not do enough – quick enough. There is a way to prevent (at the very least mitigate) tragedy in your church and to do it biblically. Your knowledge from reading and attending seminars is good. We don’t frown upon seminar work. But what do you do when you arrive back home? How do you draw up contingency plans and emergency plans when you are swimming in new information? •	Our team helps you to design and articulate a detailed church security plan. You will have a professional, solid framework in place. You will know what belongs where and when. You will not have to assemble this by yourself – hoping it will hold up under an emergency. Your plan will work! •	We help create routine procedures to secure your church daily. A simple, consistent plan that recognizes danger before a shot is fired. Prevention is the best medicine. •	We make the hard choices for you. What gear should you use? What firearms are most efficient? All the guesswork is taken away after being balanced on the scales of efficiency. These are just a few of the things our team offers. We work side by side with you to come up with the most efficient and effective security plans for your house of worship. We take the speculation and hard decisions out of your hands – so you can focus on what’s most important – ministering to the souls of your flock. Imagine the peace of mind in securing your congregation. Imagine having a Carolyn Gudger on your church campus. Imagine once again, hugging every child and parent. All of us want true security and safety. And we want it biblically. We scale our services to your comfort level. To what you feel is appropriate for your church and congregation. P.S. We can come to you if you choose to host us, or you can come to us. We can also help facilitate a single training event with more than one church to maximize training and minimize costs.